Determine if the entries are incorrect sequences and the date is within the correct time frame. For example, a physician recopying an office note may inadvertently use the year that the change is being made, rather than the right year for the chart entry. Search for discrepancies in dates. Entries may be inconsistently dated. Information may be added to a form out of sequence. For example, one medical record included a page listing the nursing home resident’s medical diagnoses, followed by the dates of the care planning sessions. The sheet contained the diagnosis of a fractured hip, which occurred in June 2009. Yet the care planning sessions were documented as having occurred in May 2009. The form did not indicate that the hip fracture diagnosis was entered after the May 2009 session. Examine the chart for discrepancies in times or entries that are not in the correct chronological order. Look at the dates when treatments or medications were ordered versus the dates they were documented as having been given. For example, in one chart, the wound care sheet included an entry on 1/22/09 that antibiotics were started for a foul smelling pressure ulcer. In reality, the order for antibiotics was not written until 1/25/09. Create a chronology of care with the dates of admission and discharge. Look to see if care was charted after the patient left the facility. Look at the medication records to determine if medications were charted as being administered after the patient left the facility. Note if the patient’s medication administration record shows that oral medications were being administered when the patient was supposedly comatose and unable to swallow. Compare the condition of the patient on days of transfer from one facility to another. Look for discrepancies in the description of the condition of the patient. For example, a pressure ulcer’s presence may be ignored in a hospital chart but documented in detail when the patient arrives at a nursing home. Compare the observations of the physicians with those of the nurses. Are they consistent? Observe for any handwritten entry made by someone who significantly erred in treatment, particularly if the entry is at odds with the rest of the chart. 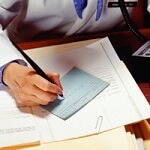 Examine the typical way in which the healthcare professional documents. Are notes usually brief but become extensive on the day of an incident? Compare a set of original medical records with that supplied to the attorney. Use self-sticking tabs or notes to indicate when documents need to be copied or examined further. Always make a list of records that have been requested to verify that everything has been received. Whenever two sets of records are located, compare them. For example, compare the prenatal chart kept by the obstetrician with the prenatal records sent to the hospital prior to the labor and delivery. Modified from, “Tampering with Medical Records”, Medical Legal Aspects of Medical Records Order this text for more tips. Get additional tips on detecting altered medical records at these links. Med League assists attorneys handling cases involving medical negligence, personal injury and other litigation with medical issues at stake. Med League nurses have expertise in analyzing medical records for inconsistencies and abnormalities. Contact us for a deep medical analysis of your case.